Last month, from 16th to 21st July 2017, the 61st ISI World Statistics Congress (WSC) took place in Marrakech. The biennial WSC is the flagship conference of the International Statistical Institute (ISI) and its seven associations. Considering the importance of the congress, DevStat decided to attend the event which brought together eminent statisticians and members of the statistical community from the five continents to present, discuss, promote and disseminate research and best practices in every field of Statistics and its applications. We are very satisfied with our participation in the event. 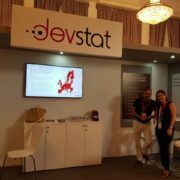 During the whole week, DevStat had a stand which worked as a meeting point between our CEO and staff and Directors and Senior officials from NSOs and Central Banks from Argentina, Iran, Libya, Morocco, Mexico, Malaysia, as well as many experts, to discuss future opportunities of collaboration. Mr Jose L. Cervera (DevStat’s CEO) was honoured to be a member the Local Committee and organised a successful session on Modernisation of Statistics in development countries. We would like to take this opportunity to thank all the organisers and we hope to have the opportunity of attend the next edition of the Congress (Malaysia 2019).